Nashville, Tenn. (Dec. 9, 2013) – Considered one of the finest Americana musicians performing today, with a musical voice grown directly from roots in Appalachian and Louisiana soil, Dirk Powell is set to release his fourth solo album and Sugar Hill Records debut, Walking Through Clay, on February 4, 2014. The album finds Powell, whom Steve Earle calls “the greatest old-time banjo player alive,” uniting the hard-hitting drums of guests like Levon Helm with homegrown electric guitars, fiddles, amplified fretless banjos and Creole accordions. Barriers between styles are cooked off and what remains is a fearlessly emotional portrait of rural American music presented as only Powell could. Throughout the 12 tracks on Walking Through Clay, the longtime Lafayette, La., resident speaks many musical languages with amazing fluency, bringing in guests like Jerry Douglas, Aoife O’Donovan, and Mike McGoldrick to help with the task. On Walking Through Clay, Powell has created a project that is the definition of Americana — a quilt that stitches together the past and present in a way that honors both. The project carries generations of stories, including those of Powell’s own family roots. In fact, his great-great grandmother, Eliza Davis, shares the album dedication with Levon Helm and inspired the title track, an upbeat song, on which banjo and fiddle step aside for an assertive electric-guitar solo. The track “That Ain’t Right” stakes bluesy territory somewhere between Cajun and zydeco, and the Celtic-tinged traditional, “Goodbye Girls” aches with a dirge-like tempo. Another cut, the hymn “Abide With Me,” features the late Helm on drums and his daughter, Amy, on gospel harmonies, with New Orleans jazz horns in the procession. They recorded it at Helm’s Woodstock studio. Powell’s film soundtrack credits range from Ang Lee’s Ride With the Devil to Spike Lee’s Bamboozled. Powell collaborated with Cold Mountain author Charles Frazier to create a musical companion to the bestselling novel, which led to Powell’s work on the Academy Award-winning film and the T Bone Burnett-produced soundtrack. Powell very recently teamed up with Burnett again for a concert to celebrate the early-60s folk era depicted in the Coen Brothers film, Inside Llewyn Davis. Taped in New York as a benefit for the National Recording Preservation Foundation, “Another Day, Another Time” features Powell performing with Joan Baez, Elvis Costello, Gillian Welch, Patti Smith and Marcus Mumford. Dirk Powell doesn’t see tradition as a re-creation of the past or something to be preserved like a museum artifact; to him, it’s a map to help future generations navigate their own roads of expression. 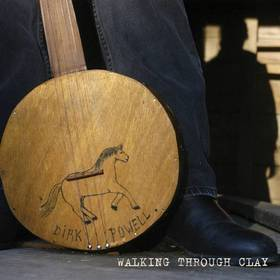 On Walking Through Clay, Powell invites listeners on his own unique journey through the highs and lows, past and present.